Another year and another tough non-conference slate to start things off for the Terriers. 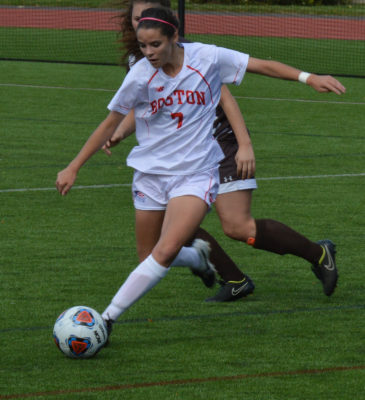 After failing to defend their 2015 Patriot League Championship title in last season’s 2-1 season-ending overtime loss to Bucknell University, BU began its 2017 season with a pair of road losses at the University of Louisville and University of Cincinnati. Next, however, came a victory, as junior midfielder Julianna Chen’s strike in the 34th minute gifted the Terriers a 2-1 come-from-behind victory over local rival Northeastern University on Aug. 24. Unfortunately for the Terriers, their triumph over the Huskies was followed by a deflating 2-1 defeat against Hofstra University before they embarked on a two-game West trip to Arizona. Impressively enough, the Terriers left the Grand Canyon State notching 0-0 and 1-1 draws at Arizona State University and the University of Arizona, respectively. Going into the school year with the tough part of the schedule almost over and already notching a win earlier than they did last season, BU head coach Nancy Feldman noted how exemplary her team’s leadership has been in these opening weeks of competition. For the most part, the step from high school soccer to the Division I level is often too great for freshmen, but not Coach Feldman’s rookies. The four-person class of goalkeeper Amanda Fay, forward Kiana Ghamarifard and midfielders McKenna Kennedy and Anna Heilferty have all found playing time, with the latter three playing in each of their team’s opening six games. They have also contributed on the soccer field, as Ghamarifard and Heilferty have each tallied goals and Kennedy representing a key defensive presence. She continued on saying Kennedy and Ghamarifard have also been key in several games. “McKenna Kennedy is playing some center back for us in critical situations and Kiana Ghamarifard is getting some minutes as an attacking player so that’s been a real plus and a pleasant surprise,” Feldman said. While the stats might show a disparity in importance between the attacking players and Fay, the young goalie should not be counted out. The Atkinson, New Hampshire, native has only 15 minutes of play behind net, but in Feldman’s eyes, her rookie goalkeeper has performed admirably to round out this young, but talented, freshman quartet. Last season was one of unprecedented lows ending with familiar highs for the Terriers. BU’s 0-10 campaign to begin 2016 was its worst in program history, as it went scoreless in all but two of those 10 losses. It took the Terriers until Sept. 24 last year to come out victorious, and in typical fashion, finished the season as co-league champions and one victory shy of a fourth consecutive NCAA Tournament berth. With BU already having a win to its name entering the school year, Feldman said she wants to see one thing from her team that eluded them for so long last season.